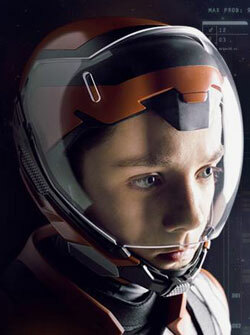 You are reading Part 3 of a five-part Ender’s Game set report series scheduled for the next week. Two years ago, in July 2011, EnderWiggin.net was born. 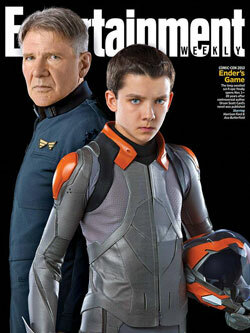 I’d been Googling “Ender’s Game movie” every year or so and finally a promising hit came back with the names “Roberto Orci and Alex Kurtzman”. I thought, “Well, I know those guys. They write practically everything awesome for both TV and movies.” After years of disappointment, this finally sounded like something might be happening. Little did I know that less than three months later, costume designer Christine Bieselin-Clark would begin the process of designing the flash suits that, for years, had only existed as fan art or comic illustrations. After nailing down the basic concept at the end of 2011, they began 3D digital prototyping to make them gorgeous, functional, and practical. Four specific army suits were created for use in Battle Room scenes, among them were Launchie, Salamander, and Dragon. Eventually, Bieselin-Clark, who had done the costumes for TRON: Legacy, found herself giving a bunch of Ender’s Game nerds a tour of her little costume office on the set. Flash suits hung on a rack in the corner, photographs of the cast lined the walls, and in a corner wall the emblems which represent the Battle School armies were laid out for us to feast our eyes on. There were nine in total for Launchie, Dragon, Leopard, Rat, Centipede, Snake (which we now know as Asp), Griffin, Phoenix, and Salamander. Bieselin-Clark credited graphic artist Zach Bannon with the design of the army logos, telling us that it was a tedious process of finding the right balance between sleek and simple yet interesting. When it came to the flash suits, she explained that they went for rich, saturated colors to avoid being too cute. “When you get a lot of colors going like that and they’re all kind of poppy, it seems so adorable, which isn’t really the tone of this film that we’re going for.” she laughed. To accent the dusty gray of the suit, they added just a few touches of color, such as burnt orange for Dragon and olive green for Salamander. Using lasers and resin, they built the helmets from the ground up. By the time production ended, they’d custom built a total of 78 helmets, with the principal cast having helmets tailored specifically for their bodies. The logo on the back of the helmet was something they needed to be able to replicate quickly in case of wear and tear, so they used what was essentially a sticker that had twelve ink passes to give it some texture to tack onto the backs. The mandible was attached magnetically and fans were built into the helmet to help with air circulation. The visor, which was attached using a clip-in system, needed open space near the mouth area so the kids could breathe and so that they wouldn’t fog up the visor while talking during filming. And while the cast may have enjoyed the cooling effects of the fan, that was a luxury that could be taken away at any moment to avoid disruption of sound while shooting. Bieselin-Clark says they installed lithium ion batteries to control the fans by remote. With most of the young cast being on set right smack in the middle of puberty, Bieselin-Clark said they had to design the flash suits with growth in mind. 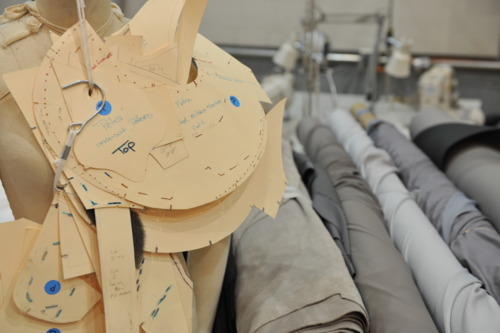 The suit was constructed of several separate pieces, with the pants extending up underneath the jacket. That way, if the jacket began to creep up, there was still fabric there to provide them with some coverage. The boots overlaid part of the pants leg and the gloves overlaid the arm. With multiples of everything, she was able to go on-set some days and have the sewing shop drop the hemline another inch on their flight suits as needed without disrupting the flow of the shoot. Finally, one of us got up the courage to ask, “Is it okay if we touch these flash suits?” She laughed, saying as long as producer Bob Orci said it was okay. He gave us the go-ahead with a quick, “Oh, why not?” And while I give her all the credit in the world for the work she did on those suits, they still felt stiff and wearing something like that seemed like it’d be uncomfortable over a length of time, which was probably why the cast was so crazy about their plain white pajamas. “No, no, cause we wanted the aliens sexualized.” joked Orci. As we continued to admire the patches on the flash suits, talk shifted to what great shoulder tattoos the logos would make for diehard Ender’s Game fans. “Let’s do it tonight!” exclaimed Ryan from Fons PR. “You are in the right town for that, just go down to Bourbon Street. We’ll send the tattoo artist the Illustrator files so they get it right.” Bieselin-Clark offered jokingly. Eventually the topic of socks in Battle School came up and they started talking about something that was both mildly thrilling and yet somewhat terrifying for a fansite. “Turns out Garrett [Warren] reads all your blogs.” said producer Linda McDonough. With what we saw in that office, it’s hard to imagine fans not enjoying the costumes she’d so carefully brought into reality. Be sure to read EnderWiggin.net’s exclusive interview with Christine Bieselin-Clark at San Diego Comic Con for more on the flash suits and how they kept them clean.